You love to stay organized, and flock towards checklists. LockScreenIt version 1.4 is for you! A great checklist can reduce stress with any errand or project, and keep your mind on track. The trouble is, where do you create it? Do you resort back to a sheet of paper with a pen or pencil most times? Or maybe you use a combination of your electronic calendars, notes, one off emails, and reminders? Top that off with worrying about using your work vs. personal email, and fumbling to find which apps to open when the time comes, and you need your checklist. That's all far too complicated. LockScreenIt now has a checklists feature, and yes, you need it. Take a look at how easy it is to access a reminder's checklist, right from your LOCKED iPhone or iPad. I like it. How do I get to the lock screen on my iPhone or iPad after LockScreenIt is installed? That's easy. Your lock screen widgets can be accessed by simply swiping right when your iOS device is locked. When configuring your lock screen widgets, move LockScreenIt to the top of your list for easy access. That's it! What if my iPhone or iPad goes dark while I am working a reminder's checklist? No worries at all. 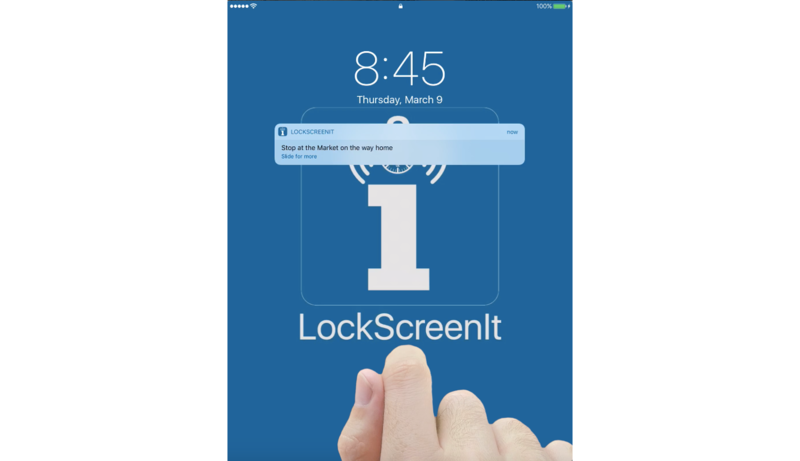 We have programmed LockScreenIt in such a way that when you return to its lock screen widget, you will pick right back up where you left off. This holds true for any type of reminder, whether it's your airline boarding pass screenshot, or your checklist of grocery items for tonight's dinner date at home. Once you've got each item on your list, tap the checkmark on your reminder and mark it as complete. That sends it to your Past Reminders list. Version 1.4.1 is on its way. It contains a nice "Duplicate" feature, that allows you to easily copy any of your reminders, including those with checklists! As always, please send feedback via the LockScreenIt Home Page - This app is all about you!